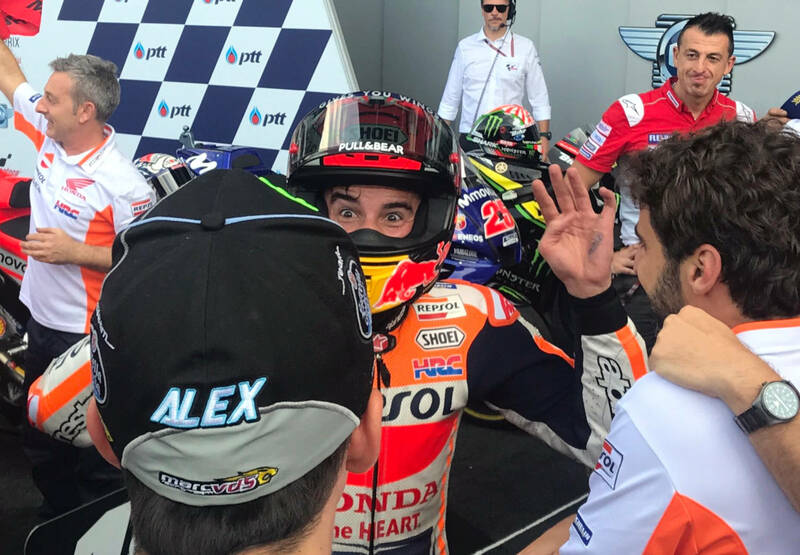 A fantastic MotoGP race in Thailand earlier today saw a large group of riders stay close to the front … ultimately leading to a three-way fight between Marc Marquez (Honda), Andrea Dovizioso (Ducati) and Maverick Viñales (Yamaha) over the podium spots. The last few laps, including the last two in particular, featured an epic battle between Marquez and Dovizioso. Trading the lead several times, Marquez led into the final turn with Dovizioso diving up the inside late on the brakes. Mimicking a move Dovizioso has made in the final corner several times against Marquez, this time Marquez was able to square up the corner and turn inside Dovizioso and beat him to the flag. Viñales finished a close third, with teammate Valentino Rossi just behind in fourth. After suffering a massive high side on Friday, in addition to his already broken foot, Jorge Lorenzo fractured his wrist and withdrew from the remainder of the weekend. He remains questionable for the next race as well. Follow this link to full race results. For additional details and points, visit the official MotoGP site. Loved that last slo-mo scene of Marquez and Dovi braking into the final corner. Looks like both pulled off about a 100 yard stoppie. Good stuff! Geez, Lorenzo sure rolled some snake eyes lately. Just when things were coming good…. I’d like to know how Yamaha managed to get their bikes back up towards the front. Two weeks ago they were mid pack at best. I think it was Vinales’s input. Not sure, but I think they are putting more weight on the rear. I heard him mention that in one of the interviews. He also said that he isn’t certain if they actually figured some out, or of the changes just happened to work for this track in these conditions. I wonder if there is only enough track time and data to achieve a base set up. Something Yamaha is capable of, but unable to refine the setup as more data is collected. Some guy named Valentino spoke of the track surface as a contributing factor in the Yamaha’s performance in Thailand.